Internet standards for credential security and processing have not kept pace with the way hiring managers, admissions staff or verification teams use the Internet today to verify a candidate’s published capabilities. Credentialing has changed over the years, but it is still chained to legacy methodologies such as paper, PDFs, and web pages. Current means for verifying credentials from service providers are costly and often unreliable. Most credentials are managed in multiple stand-alone systems, making it very difficult to securely exchange and verify their authenticity electronically. A TrueCred® digital credential solves this problem. Resume fraud costs employers over $600 billion annually. Our digital badge platform empowers employers and digital credential verifiers (those who verify and validate digital badges) to make hiring decisions with confidence. Trust only TrueCred®. When data breaches are in the news constantly, and so-called degree mills are pumping out fake credentials, many employers are asking how they can trust digital credentials. As we move our credentials from our physical walls to virtual ones like LinkedIn, how do decision makers verify them? Our proprietary technology is the first SaaS solution for verifying digital credentials using tamper-proof, cryptographic technology, making it possible to prove a credential’s authenticity, who issued it, and to whom it belongs. 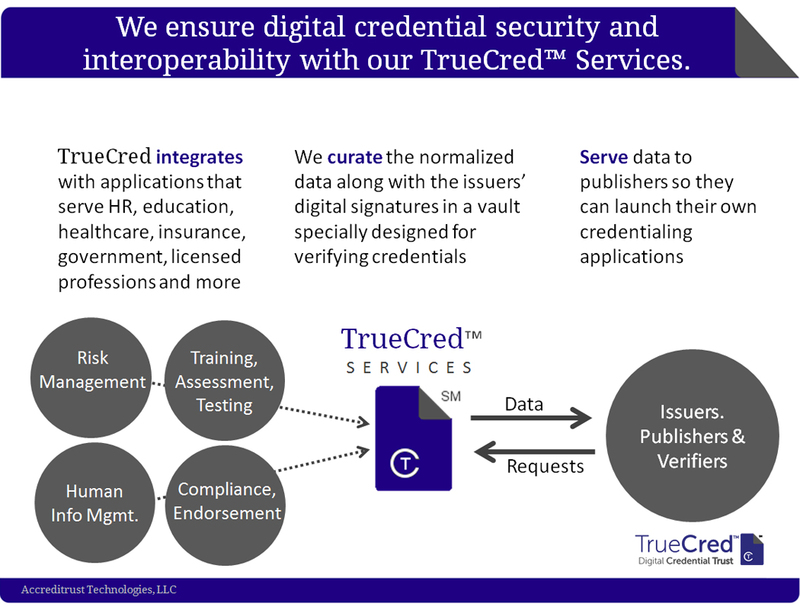 Only TrueCred® can be independently verified.